my main research interest is in applied microeconomics. i am currently working on projects related to the economics of crime, drug use and criminal sentencing. in the past i've worked on several different projects related to education, an area in which i'm still interested. We evaluate the effects on crime of a localized policing experiment that penalized the possession of small quantities of cannabis in the London borough of Lambeth between 2001 and 2002. 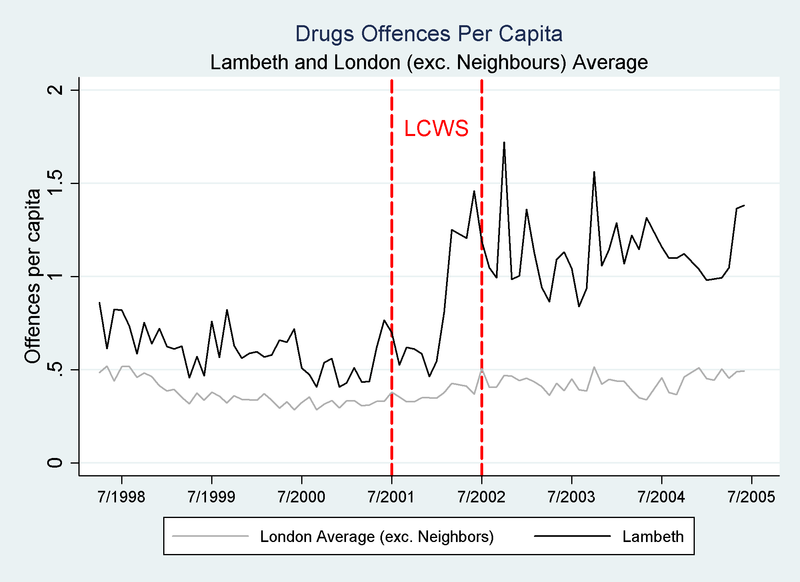 We find that decriminalization led to a surge in drug related offences (see the spike 6 months in to the policy in the graph above), and a collapse in arrest and clear-up rates for drug related crimes in Lambeth. However, the policy does allow the Lambeth police to reallocate their effort towards non-drug related crimes, leading to permanent reductions in nearly all other crime types. some creative cycling shorts from around the world: df, la, gran canaria and yorkshire.